Russia: Saraki presides over session at IPU – Royal Times of Nigeria. 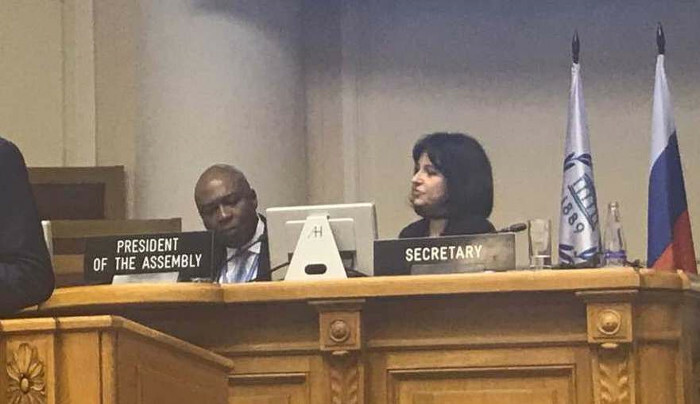 The President of the Nigerian Senate, Dr Bukola Saraki on Monday, presided over a session at the ongoing 137th Inter Parliamentary Union (IPU) in St. Petersburg, Russia. The session chaired by Saraki was a debate which focused on ending the grave humanitarian crisis, persecution and violent attacks on the Rohingyas as a threat to international peace and security. The session also deliberated on ensuring the unconditional and safe return of the Rohingyas to their homeland Myanmar. Saraki presided over speakers of parliaments from many countries who are participating in the 137th IPU. Nigeria is one of the countries faces with humanitarian crisis with the North Eastern part of the country still suffering grave crisis as a result of the activities of the violent group, Boko Haram. On Sunday, while making a presentation during a general debate, Saraki called for international conference on the North East and Boko Haram threat in Nigeria. According to him, convening an international conference like the ones convened in London on Somalia and Syria, would go a long way in finding lasting solution to the problem in the region. “Nigeria’s North East region has suffered terribly under the onslaught of Boko Haram insurgents. “Two million Nigerians are internally displaced or have fled to neighbouring countries like the Lake Chad region, where 4.4 million people are threatened by food insecurity. “Of the funds needed to address the problem, less than half has been raised. The United Nations has called the situation in the Lake Chad region the most neglected humanitarian crisis in the world. “The 8th National Assembly is at the forefront of improved coordination efforts to overcome institutional and logistical impediments in the way of getting aid for those in need. “We have reached an advanced stage in the plans for a development commission to tackle the crisis in the North East, incidentally the region with the highest poverty rate in the country. “We have also made economic growth and greater investment the core of our legislative agenda. “The sooner we deliver economic reforms and greater prosperity to all Nigerian, the sooner we can achieve a more inclusive society and minimize societal divisions and grievances,’’ he said. The 137th IPU has as its theme: “Promoting Cultural Pluralism and Peace through Inter-Faith and Inter-Ethnic Dialogue”. Saraki expressed optimism that the 137th IPU would offer a lasting solution to the growing world conflicts. Initially, the organization was for individual parliamentarians, but has since transformed into an international organization of the parliaments of sovereign states.